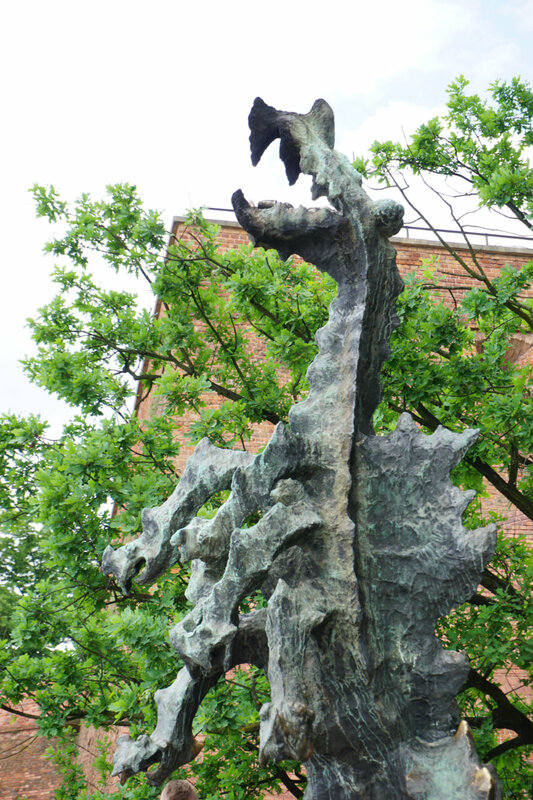 Once upon a time… many stories start with these famous words, the stories about dragons in Krakow do, too. Even today, dragons are very much present in Krakow and receive a great deal of honour every year. There are many versions of this legend and they are frequently told in Krakow. Dragon Smok Wawelski lived in a cave under the Wawel around the time Krak, founder of the city, lived in Krakow. Every day, the evil dragon went on a hunt for food. On his quests for food, he would destroy farmland, kill citizens, burn down houses and feast on livestock. Only when the citizens of Krakow brought one young lady every month down to his cave, the damage could be kept under control. The king tried anything to defeat the dragon. He sent his bravest knights to fight the beast, but none of them survived his fiery breath. Then came the day that no young ladies were left in the kingdom anymore. None but Wanda, the daughter of the king himself. The king was desperate and promised his daughter to anyone who could defeat the dragon. Many young and old men gave it their best effort – but did not succeed. Until, one day, young shoemaker Dratewka, chanced it. He filled a dead lamb with sulphur and placed it in front of the dragon’s cave. The dragon swallowed the lamb and the sulphur made him very thirsty. Craving water, the dragon came down to the Vistula and started to drink. More and more water he drank, but nothing satisfied his thirst. He drank so much water that finally his stomach burst and the dragon of Krakow died. Young Dratewka got to marry the daughter of the king and they lived happily ever after. Incidentally, my arrival in Krakow fell on the day of the children’s Dragon Parade. A few years ago the first weekend in June was established as the time to celebrate Smok Wawelski. On Saturday, families come to the lawns underneath the castle at the Vistula for picknicks and playtime. Children can be seen playing everywhere, it is a family outing for the people of Krakow. After dark, fireworks can be seen and alongside them enormous dragon-balloons lift off and dance in the night sky. Tickets have to be purchased for this part of the event. I arrived in Krakow on the Sunday, just in time for the big Dragon Parade. I had no idea where the Parade would be, their website was Polish and in my opinion not very well structured. It turned out not to be a problem. I simply followed the families and the children. 2017 saw the 17th Dragon Parade. About 30 groups of kids had spent many weeks crafting dragons from all around the world that they now proudly presented at the parade. There was no kind of dragon that wasn’t part of the parade. Asian dragons, water dragons, Spanish dragons and the most creative and imaginative dragons I had ever seen. It was obvious how much fun the kids had crafting them and that they had put all their creativity into their designs. The parade ended on the market square in the Old Town in front of the Cloth Hall. The groups carried their dragons onto a big stage where they got the chance to present their creations. I truly enjoyed the festivities in Smok Wawelskis name and it was the ideal start to a dragon hunt through the city. Where to find the dragon in Krakow? As part of a visit of the Wawel, the dragon cave underneath it can also be seen. Only in the summer months, though. The tour starts at the Tower of the Thieves in the castle. The tour is not free of charge, but coming in at 3 Zloty also not really expensive. Stairs lead 81 meters down to the 270 meters long cave. The cave has three sections. The first one has the lowest ceiling. Up to the 19th century, it was used as a reservoir for the castle. The second section is the biggest one and characterised by magnificent rock formations. In the third section, I discovered old chimneys, projections on the walls and fascinating karst structures. On the lawns at the Vistula underneath the Wawel, the original Wawel Dragon Sculpture can be viewed. Many visitors do so and those with a little bit of extra time stay and wait for the fiery breath that the dragon releases every five minutes. A spectacle that especially the children liked when they came for the parade. This must’ve been such an unforgettable experience. How lucky you got to witness this during your stay! And thanks for sharing the Krakow dragon legend with us. This is my first time hearing something like this. Would love to do the tour for sure! This is a totally fresh perspective of Krakow that I have read in a long time. Normally one associates Krakow with the lovely old town and of course, the spectre of the horrors of Auschwitz in the vicinity comes to mind. But this is a delightfully different and colourful Krakow. The dragons look so colourful and cute. I am sure this is something that the kids would freak out on. 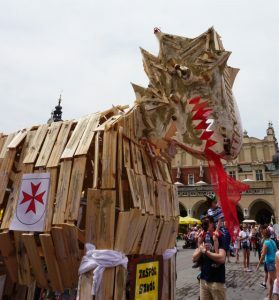 It would be a great idea to plan a trip to Krakow around the time of the dragon parade. Enjoyed reading the story behind the dragon. Sounds like a fun festival to check out while in Krakow! Lovely! Reminded me of the Dragon and Lion dance shows during Chinese New Year. Oh how lovely. I had heard about the dragon statue but had no idea there was a parade in the town. It sounds like a wonderful time to visit. This is such an insightful post about a different side of Krakow that I haven’t heard about before. I find this more interesting than a normal guide of the city. Our kids would have LOVED this parade! I’ve only been to Krakow in passing over a decade ago but would love to go back one day. I love stories about dragons and have never heard of this one. I think this would be such an interesting and unique tour :) Will keep in mind that it’s only available during the summer months.